1. I want to rent a car at the Malaga train station. How far is the train station from Malaga Airport? a) Do I need pay a ticket for car rental when I go out of Malaga train station in my hire car? b) How do I fill up in gas stations, is it self service or there is an operator? 3). I will arrive in Malaga around 8 pm, is it safe to drive at night? I wrote back to Dave: Hello Dave, first of all Happy Christmas. It’s 8pm on Christmas Day, the 25th will be over by now for you in Singapore. 1) Malaga train station is approximately 13kms from Malaga airport. 2) I checked on Google Maps, driving directions putting in Malaga Train Station as point of departure and Marriotts Marbella as the destination and if you take the A7 then the AP7 toll road (around 4 euros) it is 49kms and if you follow the A7 all the way it is 55kms. I would take the second option because you just stay on the A7 and you don’t have to leave it to get on the toll road (AP7) and then get back onto the A7. 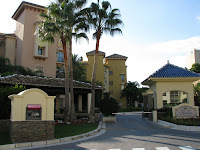 To get to Marriotts Marbella it is less complicated. It is very wet and black night at the moment and I think it would be a good idea to add a GPS onto your car hire option especially as you will be driving at night. Remember if you haven’t done it already, you can book a car at a very reasonable price through the Gomarbella car hire section and pick it up from Malaga train station. As soon as you book I will get an email confirmation. a) Leaving Malaga train station with a hire car you won’t need to pay anything. You will be given a ticket or a code to pass through the barrier. b) About 95% of the gas stations in the province of Malaga are self service. Be careful you are putting petrol in, gasolina, or diesel, gasoil, depending on what your hire care uses. Your tank should be full. When you are putting in fuel after 10pm at night, most fuel pumps in Spain are in Prepago which means Prepayment. You need to tell the cashier how much you are putting in and pay before you refuel the car. 3) I don’t think the roads will be very busy at that time of the evening, probably about 9pm by the time you get on the road, but take care if it is raining and just drive slowly. Remember my GPS recommendation and bring this street address with you. Get the hire car office to set up the GPS and programme it with the destination. Best wishes David and have a good stay. Please accept my apologies for not writing back when you first wrote. I was reading my emails in Australia back in September when you first contacted me but came across this by chance on my computer at home. Long story but sorry again. I really hope you have been able to organise transport at the best possible rates. If you are on the Costa del Sol then I hope you are keeping dry in the non stop rain right now. If I can help you with anything during your stay or travels, please give me a second chance. Have a great Christmas and thanks very much for writing in. We have a group of 6 coming to Malaga and then to Marbella Christmas Day. We have to get to Crown Resorts from Malaga and then plan to go to Seville, Gibraltar etc over the next 6 days and return from Malaga airport. 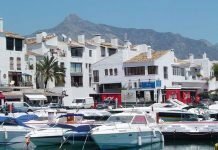 Yes the Malaga airport shuttle service to Marbella bus station is the best and quickest way to get to Marbella. I phoned the Portillo bus company on 902 450 550 to check the information below because Monda does not appear on the published routes out of Marbella. Your bus will stop first in Ojen and then in Monda before travelling on to Coin. It will take about 35 minutes to get to Monda from Marbella. I hope this helps you and that you have a great visit to Monda. Thanks for visiting gomarbella and best wishes from Marbella. Like your site a great deal. My girlfriend and I are making our way to a farm in Monda for a week after flying into Malaga airport. 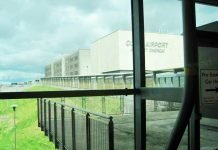 I am wondering the best and cheapest way to get there from the airport. I believe the bus from Malaga to Marbella will be our best bet, but we are not sure how to get from Marbella to Monda. Any ideas would be a great help. I think our flight gets in at 13:30 on a tuesday.